This fireplace is more than I imagined! It's perfect! Looks great in the living and receives a compliment everytime someone walks in. Worth the price. 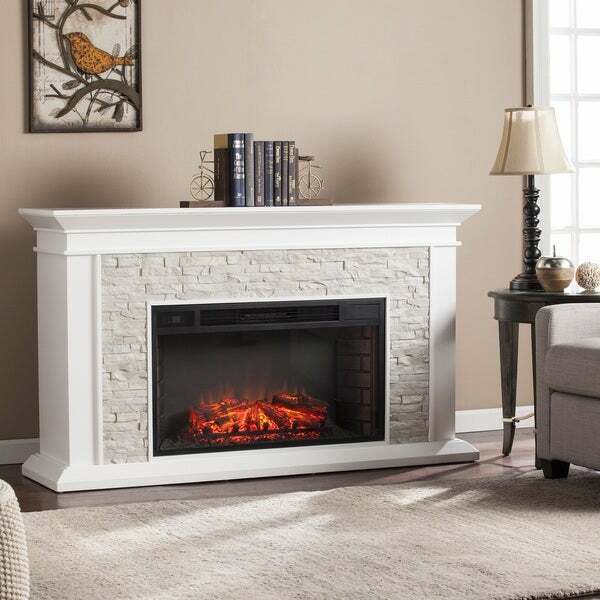 Warm up by the fire without all of the work, with this electric fireplace from Copper Grove. The traditionally-styled frame is accented with rustic stonework and a large decorative mantel. Adjust the flames, thermostat, and timer with the included remote, and enjoy peace of mind because the glass always remains cool to the touch. Recommended Room Size Medium: 151-400 sq. ft.
Dimensions 15.5 In. X 60.25 In. X 35.25 In. This fireplace is an eye-catcher. I have gotten nothing but compliments since putting it in our living room. I love that there are so many different settings and that you can turn on the fireplace lights for a fire effect without the added heat. I especially like the random mode where the fire appears to brighten and dim simulating a real fire. The remote and timer settings make it extremely easy to use as well. To top it off, it could not have been easier to put together. 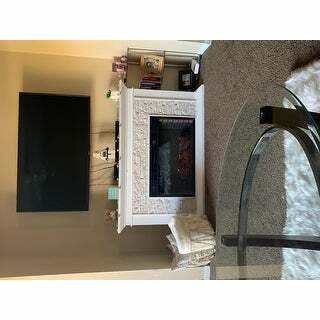 I thought this was a pretty good looking fireplace till I saw the dimensions. Because I have a 60” inch tv I needed something wider at least 70” inch. So I returned this before it arrived and overstock helped with hassle free with that and I ordered the 72 inch wide copper grove marigold. When that arrives I’ll write a review for that. 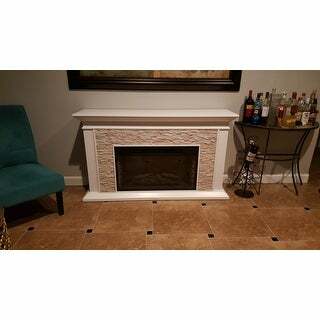 We were just done installing the faux stone electric fireplace and it looks great! 👍🏼 We seriously didn’t expect it to be this nice, but it exceed our expectation. My family and I are normally not comfortable buying stuff online but we gave this one a try because of all the nice review. We’re very happy with this purchase! The order was simple, products were delivered a few days later, and the installation was pretty simple and easy to assemble. We turned it on and the flame and log are pretty, and it does heat up the room. It’s really beautiful in person! It gives out good heating, different setting for the heating and fire effect. My apartment is 750 square feet and heats the whole apartment! And keeps it warm. It’s a 50inch tv on the wall for size reference. I was moving into a condo that did not have a fire place, something I have been spoiled with for the past few years. I looked for an electric one for months and kept coming back to this one but was worried the whit would clash with the tan walls and coffee colored carpet, so I almost got a brown one, but am so glad I went with white. It brightens up the room and is the perfect size for a 55 inch TV. I love that the back is hollow and can easily hide the router and extra cords. There are many settings to have different flames, backlight etc. the heat function is great. 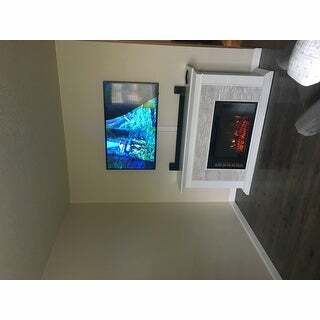 I live in FL so it already might be quite silly to have a fire place, but it gives off enough heat to warm my pretty open floor plan 2/2, slightly under 1100 sq ft condo. I only put the heat on one morning when the temps were in the 40s a few weeks ago, and was surprised it heated up the living room quickly! I am very happy with the purchase and received lots of compliments on it so far! I was looking for a fireplace for my living room for 3 months. 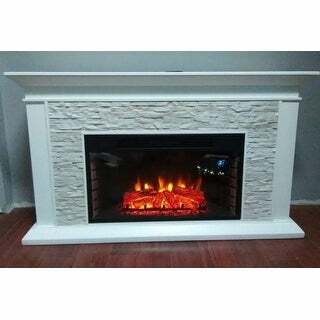 I checked online and see that Oliver & James Lega white faux stone widescreen electric fireplace. I was a little nervous to buy it. but, I finally make decision to buy it. Now I am in love with it. The color matches all of my furniture. It came in 2 boxes, very easy to do assembly. In love with it so far. Came in 2 boxes one weighing about 85 pounds, other weighing about 35 pounds. Took hubby and I an hour to put together. Be careful when tightening the piece that grabs onto screw, they break easy however there are extra pieces. The mantle would not sit right on one side, but it's not noticable to look at, we just have to be cautious moving it. You can feel the heat coming out if you are a foot in front of it. Otherwise you don't feel the heat, but it does help heat our huge living room. The wood is pure white with the stone detail being an off white. We have a 50 inch TV sitting on top right now but will be mounting TV to wall. However I feel it is sturdy enough to hold the TV on top if someone wanted to not mount t.v. This fireplace is wonderful! I was hesitant at first to even think about putting one in my living room because I've always remembered electric fireplaces to be tacky-looking. But the technology sure has improved, and this one is really quite beautiful, especially at night! The flames move realistically and the lighting options are nice. It also throws out some heat, which is great, especially here in New England! 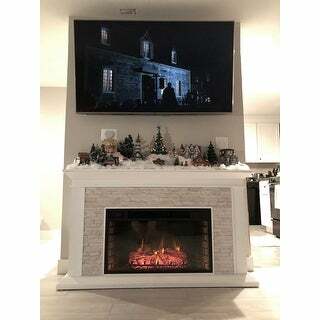 My husband put it together while I was at work, but he didn't complain about it being a difficult task, just that the fireplace is quite heavy. Everything was shipped quickly and well-packed, with no damage. At some point I"m going to paint the wooden surround the same color as our walls, so the piece will look more built-in and permanent. 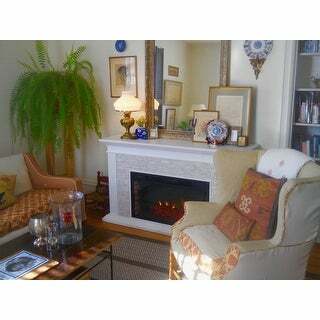 But in short, we really love this fireplace and are very happy with the purchase! I bought this one for my TiVi 75 inches . Perfect length and it is so easy to install like 20 mins for 2 people. They came out just beautiful like picture and it has so much space to cover all the things behind it . Once completed this is a beautiful fireplace, only problem was it took several shipments to get one that wasn't damaged. This fireplace comes flat packed like IKEA furniture and assembly is about the same as IKEA also. Unfortunately the mantle in three of the shipments was damaged. We ended up keeping the last shipment even with minor dents and scratches because it was the best of all the shipments. Overstock customer service was wonderful and extremely helpful in getting it right. 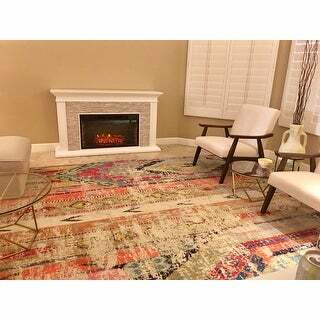 We are very happy with the high quality service we revived from Overstock. The best quality piece of the the fireplace is the actual fire/heater insert. Very sturdy with lots of different settings/options for heat and aesthetics. It came in more pieces than I thought and was time consuming to put together but I in the long run it was worth it. I suggest at least two people to put together. I love the look and the faux stone. It does look just like the picture which I'v bought things from other places and I wasn't happy. The heat that dispenses is from 86 to 99 and it is a substantial amount of heat. I am very pleased with it. 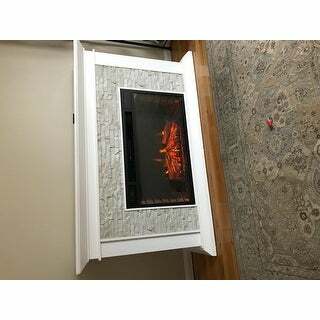 I was looking for an electric fireplace that looked realistic while also being large enough for my space. This one fit the bill perfectly! You would never know this wasn't built into my home, I am obsessed! Beautiful fireplace. I was worried it would end up being cheap looking, but that is definitely not the case. I was able to assemble it on my own in about 90 minutes using only a phillips screwdriver. The hardest part was lugging around the giant boxes it came in. It fits my 55” TV nicely and adds a great focal point to the room. Would definitely recommend. Went together easily and is very sturdy. Very happy with it. Looks great. We received this in 2 days. We love the look and it fits in perfectly . My husband thought it was going to be hard to put together but he was pleasantly surprised that it wasn’t that difficult! The heater does throw off a fair amount of heat. 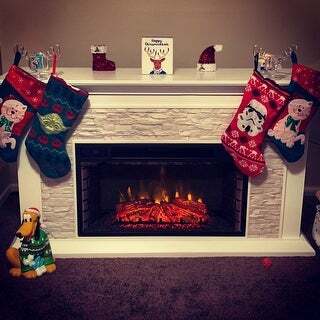 We are glad we purchased this fireplace! We absolutely love it! We had an initial problem as part of it was damaged, however the issue was quickly resolved and the look goes perfectly within our living room. Perfect!!! Setup was a breeze and it looks so nice that everyone thinks its built in to the house!! Not cheap looking at all ! This ended up better than I could have hoped for! Every person that has seen my house comments how much they love the setup. It’s a nice source of heat as well to use at night so that I don’t need to heat the whole house. Super convenient since I prefer to keep the bedroom cool when sleeping. Quick tip: if placing under a tv I had an electrician put in an additional power line so that it doesn’t run on the same line as the tv. This fireplace is gorgeous and the flames are very real looking. Love it! The mantel corner was slightly cracked and chipped, but we didn't notice it until the very end when we were putting the mantel on. Didn't plug it in yet due to the requirements of having a 16 amp plug, not sure we did, so have to verify that first. Looks nice so far! 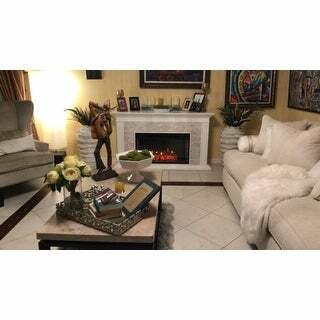 Love my faux stone fireplace! Better than expected! Love the included remote. Easy to use. Looks attractive and sturdy. 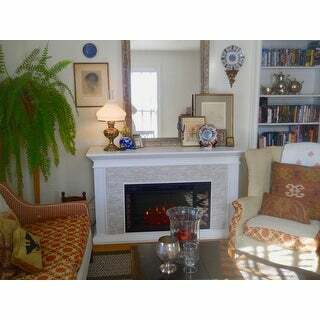 Really like the mantel..can use for pictures and decorations. The fireplace is absolutely beautiful. The dimensions were exactly as described, which was essential. The only reason why I did not give it five stars is there’s a weird smell. I was hoping after a couple of days it would be gone, but it still here and it’s strong. 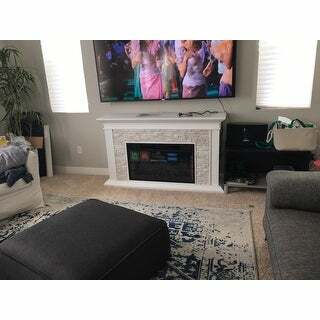 "I’ve had the fireplace for about 4 days now and all of a sudden a motor like odor appeared...is that normal? Will it disappear? I have no used the heat, only the flames"
I've had mine and have used both the heat and flame, I get no odor from it at all. Check your outlet and all nearby electronics for the smell. Keep electric cords away from heater. I hope this helps. "What is the return policy on this item?" "Curious if the heat blows up or out? I know some people have a tv mounted, but want to make sure I protect the screen. Thank you in advance." It blows out. This fireplace is wonderful. "Curious if the frame of this is really bright white? I see from other questions that the bricks are more of a cream or beige, and looks that way in customer pics. My living room is browns, creams, oranges. 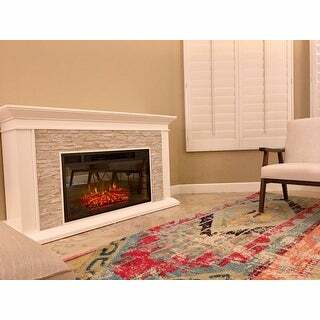 I loooove the look of this fireplace, just wondering if it will be "too white". Opinions?" 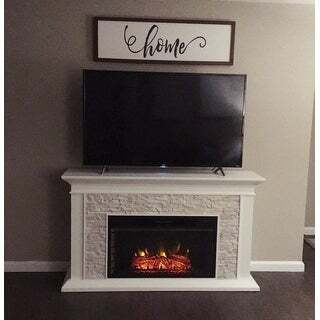 This fireplace is a cream white. "Does anyone notice a strong odor? I’ve only had it for two days and the flames aren’t working. But overstock called me today to check on my satisfaction and when I told them about the flames not working they immediately suggested remedies and are working on it for me. I wasn’t going to call them until the weekend was over. They work every day it seems. Great customer service. Looking forward to seeing flames. But the smell? Does that dissipate?" "Does this unit have a blower?" Yes but it is small. "When its gonna be on Stock again?" 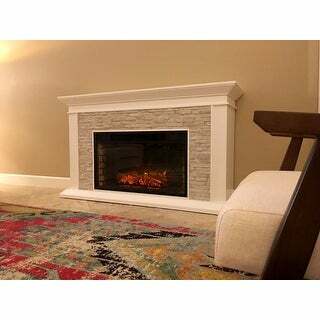 How to Buy an Electric Fireplace from Overstock.com. Our guides provide customers with information about how to buy an electric fireplace.